Passionate about playing full-time football and furthering your academic profile? Feel your potential in the game has not been properly developed? If the answer to those two questions is 'yes' then you need to consider joining the Tonbridge Angels Academy which starts at the next academic year 2018. Have you got what it takes to follow Liam Smith, Callum Adonis- Taylor, Dom Welsh and Tashi-Jay Kwayie all former Angels Youth players who are now members of the 1st team squad? Make sure you apply by http://form.jotformeu.com/72962217180355 or by emailing tafcacademy@outlook.com as soon as possible to book your place. 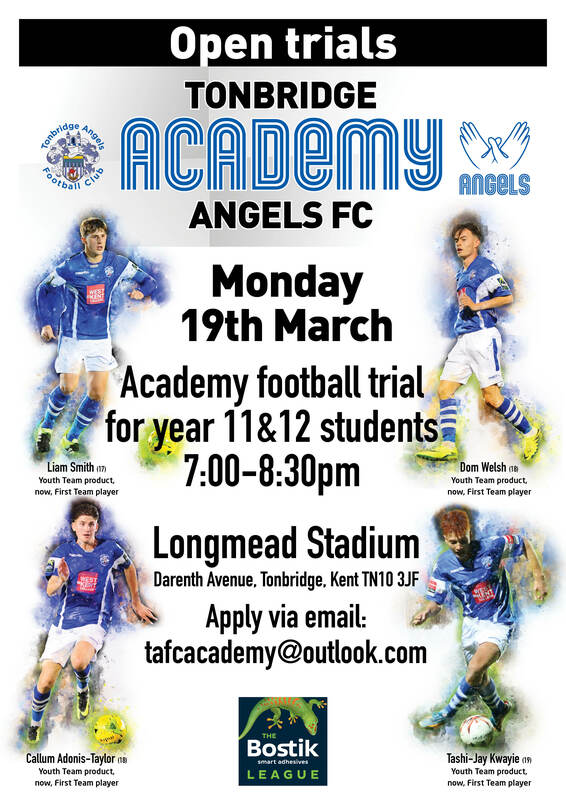 The new Angels Academy is set to launch this September and will provide you with a chance to develop your footballing potential while at the same time providing you with nationally recognised qualifications (A Levels and/or a BTEC Level 3 in sport) & gaining your FA level 1&2 coaching badges. Our accompanying image shows the footballers who are now part of the Tonbridge Angels 1st team squad and who came through the Longmead set up. It can now be revealed that heading up the Academy will be Tom Parkinson (UEFA A Licenced coach), club captain of Tonbridge Angels and Jamie Coyle (UEFA A Licenced coach & FA Tutor) Joint manager of Dartford FC who currently compete in non-league’s second tier, National South. Both Tom and Jamie have substantial experience in youth development and teaching. They will of course be supported by a top class educational establishment, Hugh Christie College, to provide that classroom backup that is so vital within a successful Academy. As well as daily football training, Academy members will have the opportunity of being part of a squad competing in the National u19 youth League or the Kent academies league aswell as the prestigious FA Youth cup.